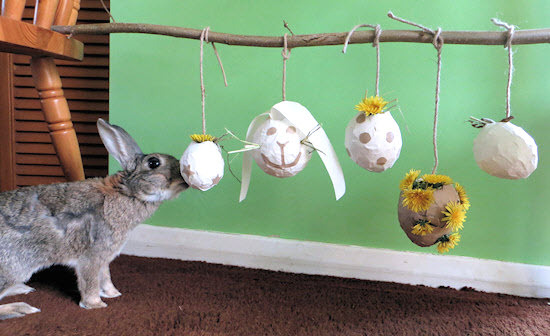 Make pinatas for your rabbit! Blow up some small balloons. Cut sheets of ink-free paper into strips, then put the pieces in a mix of flour and water. Wrap the soggy paper around the balloons, covering them well with several layers, letting the paper dry between each layer. Cut pieces of brown paper into decorative shapes, soak the paper shapes in the flour and water mixture, and put them on the pinatas. Once dry, pop the balloons and fill the pinatas with treats for your rabbit. Cut a rabbit-safe stick to the width of each pinata, tie one end of a sisal rope on each stick, and put the sticks into the pinatas. Hang the other end of the strings on a large stick to make a foraging station. Consider poking some holes in the pinatas to help your rabbit get started.